The. 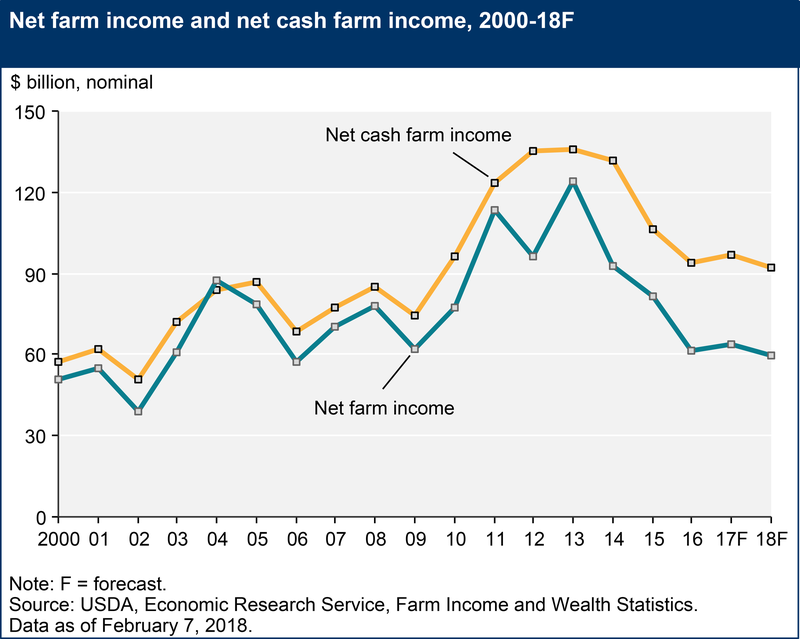 U.S. Department of Agriculture's farm income forecast for 2018. Aready, it’s tough for producers to turn a profit on grain, due to good weather and large harvests in recent years, Gerlt says. 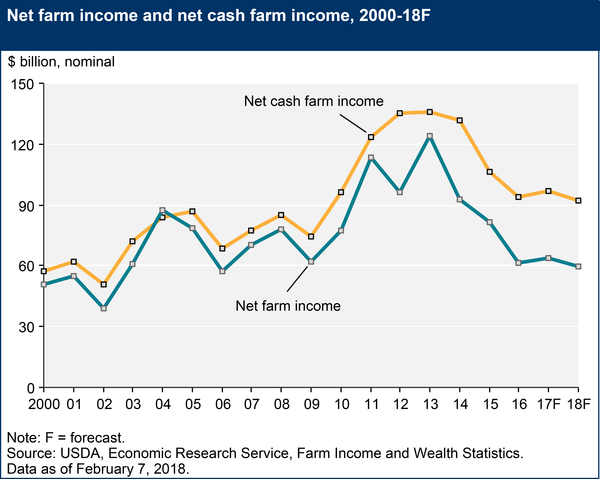 After peaking at upward of $120 billion in 2013, farm income for the past three years seems to be hovering at about $60 billion. 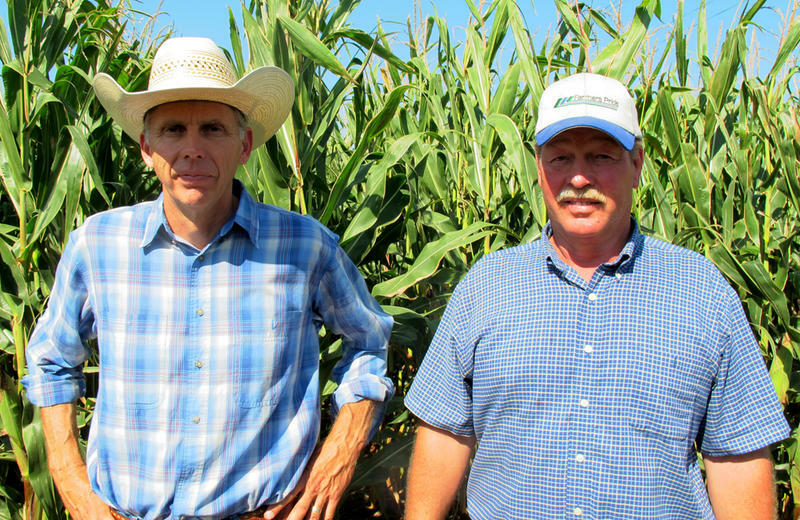 Beyond crops, dairy farmers will likely deal with a fourth year of lower milk prices. But the USDA has good news for cattle ranchers, who can expect a slight increase in business and cheaper animal feed. Consumers, meanwhile, will keep seeing cheap prices at the grocery store on beef, pork and vegetables. The USDA’s forecast also says farm debt will go up by $3.8 billion to $389 billion, nudged up primarily by real estate debt. Direct government farm payments are set to decline $2.1 billion due to drops in payments from two farm safety-net programs (outside of crop insurance). Agricultural Risk Coverage and Price Loss Coverage are calculated on averages based on prices and revenue, which have been low. “Certainly with this tight income environment, folks are going to need to (have tough conversations) with their bankers to see how they can get lines of credit or operating loans and find ways that personally on the farm they can find some more efficiencies,” Newton says. 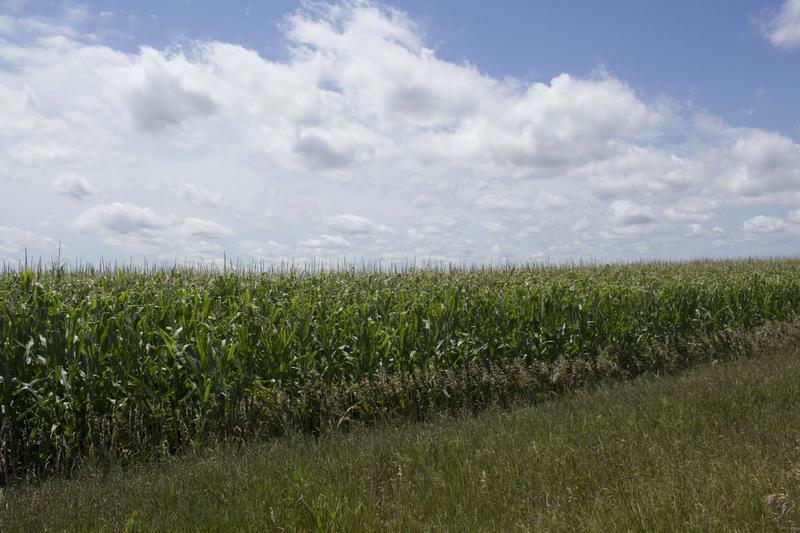 A new partnership between the Iowa Department of Agriculture and Land Stewardship (IDALS) and the U.S. Department of Agriculture’s Risk Management Agency, which manages the federal crop insurance program, aims to keep more of Iowa’s farmland green in the off-season. 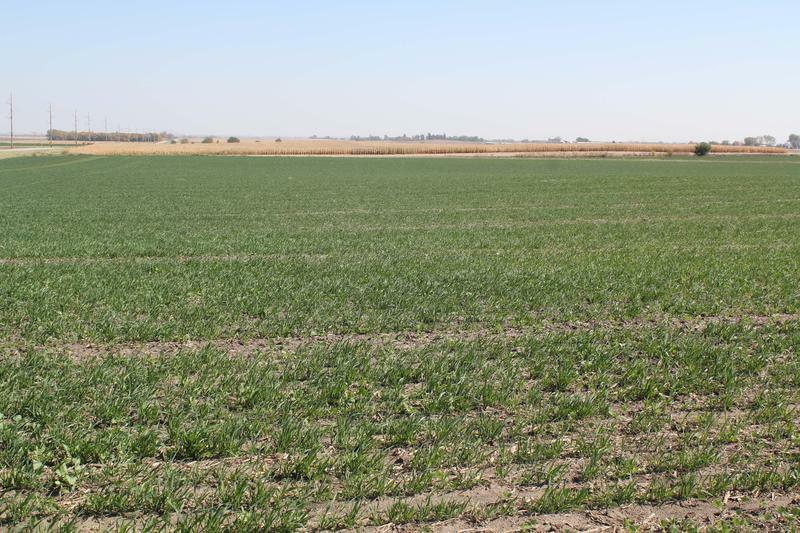 The cover crop premium discount will give farmers five dollars per acre off on their crop insurance premium for acres they plant with cover crops. Practical Farmers of Iowa’s Sarah Carlson says in a national survey farmers indicated they wanted this type of program.